← Gentrification, Where Did Everything Go? Will and Jaden Smith: It’s Always a Family Affair. Just the other day I saw a taping of BBC’s The Graham Norton Show and his guests were Will and and Jaden Smith. Although I’ve grown away from television because of the limits it places on your time, this episode rejuvenated me. It took me back a couple of decades where there were some legitamate attempts to bring the bigness of the Hip Hop world to American families on a weekly basis. As the 90’s ushered in the dynamic perspective of youthful voices and music of America’s urban cities through Hip Hop, The Fresh Prince of Bel Air made sense. Just like The Cosby Show had done for years, The Fresh Prince of Bel Air offered a perspective of American life that wasn’t promamently featured on network television. This clip of Will Smith and his son Jaden on The Graham Norton Show reminded me of the family aspect in Hip Hop. Although there were battles, diss tapes, and boasts of the best neighborhoods, there was a loyalty to your unit and wanting them to succeed as much as you did. Since the inventions of the moving image producers forged a bond with the American family, for it was through silent films, radio, and later network television where Americans were feed social norms. The television patted American culture on the back for maintaining all that was great about it: the nuclear family, consumerism, racism, stereotypes, sexism, democracy, and some many more central aspects of our society. Television showed what mainstream should respect and despise about our culture. 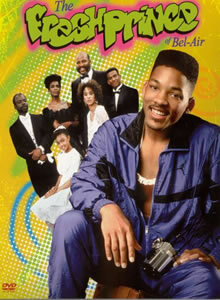 Although a rapper getting shipped off from crime ridden Philadelphia to a life of luxury in Bel Air, California may not have been realistic for many that tuned in, the show displayed a Hip Hop centered life as something America should see as a pat on the back now. After all, how realistic was The Cosby Show for those of us that grew up in a single household or a poverty stricken community riddled with drugs, crime, and hopelessness? However, those shows breathed in new perspective, opportunity, and optimism in families with none. In the 70’s, 80’s, 90’s, and for a big portion of the new millenium, Hip Hop has been about groups: The Juice Crew, Tribe Called Quest, Leaders of the New School, Grand Master Flash and the Furious Five, The Firm , The Roots, BDP, and so many more. These rap groups were extensions of the neighborhood and the family. Hip Hop provided the means for poor kids to support their family and celebrate it. The energy needed to stay vibrant always came from the family. Although there was a lot of money thrown at it, the story line was always about what the rapper does and did for his homey. In an interview with The Guardian a few years back Rakim said, “…Some weeks we might have $1500, some we might only have $500, but my family understands all that. I’m not a mainstream artist. But I’ve seen my kids being born, I’ve seen them take their first steps, I’ve seen them grow up and start school. That’s worth more to me than any umpteen million dollars.” This sentiment shows the financial chasm between Rakim and artist like Will Smith whose net worth is unfathomable for rich people. However, with just a couple of peeks into their family’s network it appears that Smith and Rakim still share Hip Hop’s essential element of family. There is such a great financial divide that it’s hard for Americans not to separate themselves by what they have and don’t have. For so long Hip Hop reminded us of what we will always have, our family. How wonderful was it watching Will Smith beatboxing, his son emceeing, Jazzy Jeff djing, and Alfonzo Ribeiro dancing on this show to one of my favorite sitcom melodies ever. I mean how many sitcoms have melodies that are rap songs? This clip captured the essence of community and family that Hip Hop displayed in the beginning. As Hip Hop evolves into a more mainstream art what we see, for the most part, it doesn’t always represent all the family essentials. No, it doesn’t always have to be conservatively composed in order to promote what is good, but why not have a party hook that leads us all to dance in a direction of unity? Imagine a family that had beatboxer, a beeboy, an emcee, and a dj rocking with each other, man that seems like fun just thinking about it. great piece. fam is key.